Sensory play is a type of play that is very beneficial for children. Starting at birth, babies begin to explore the world around them using their five senses. As children grow, their senses are their most familiar and most basic way to explore and process new information. Sensory play is important for developing a child’s senses and is a great way to explore the world they live in! 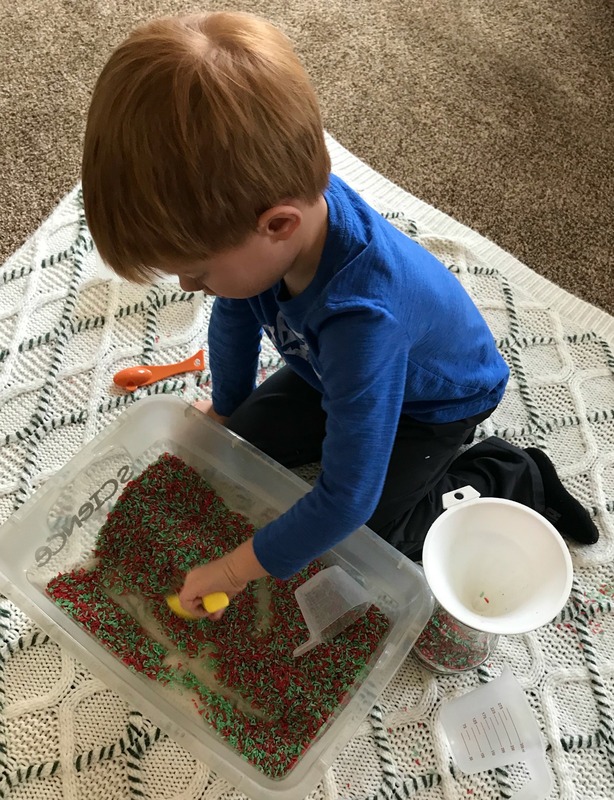 Today I’m excited to share 3 very fun and easy sensory play activities for kids. These are great to use with toddlers, preschoolers, and really all ages of children. 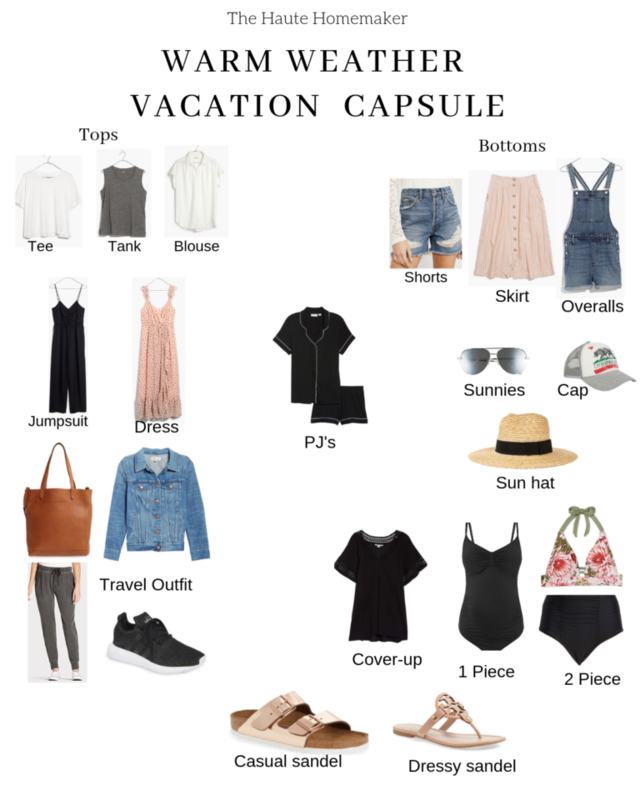 I love to make activities simple because as parents, we are always busy and don’t have time to prep elaborate activities! Play dough is so easy to make and this recipe smells awesome! The reason it smells so great is because you use Jell-O! I love play dough because kids can be creative with it, it’s great for building strength in the fingers and most kids enjoy playing with it. Mix all the ingredients together in a pot. I use to a whisk to help blend everything together. Cook over medium heat on the stove. Make sure to stir the mixture frequently. Cook the dough for about 5-7 minutes. Once the dough starts to gather together into a ball, take it off the stove. 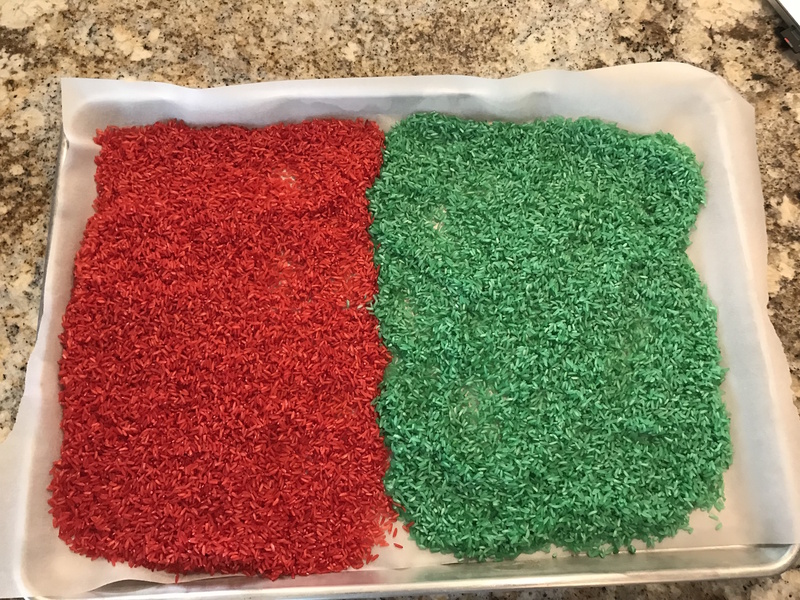 Sprinkle flour on a mat and set the ball of play dough on it. Cool for 1 minute, and then knead it until it’s no longer sticky. After it’s made, invite your little one to play with it! I created an invitation to play with this plastic box I got from Hobby Lobby. 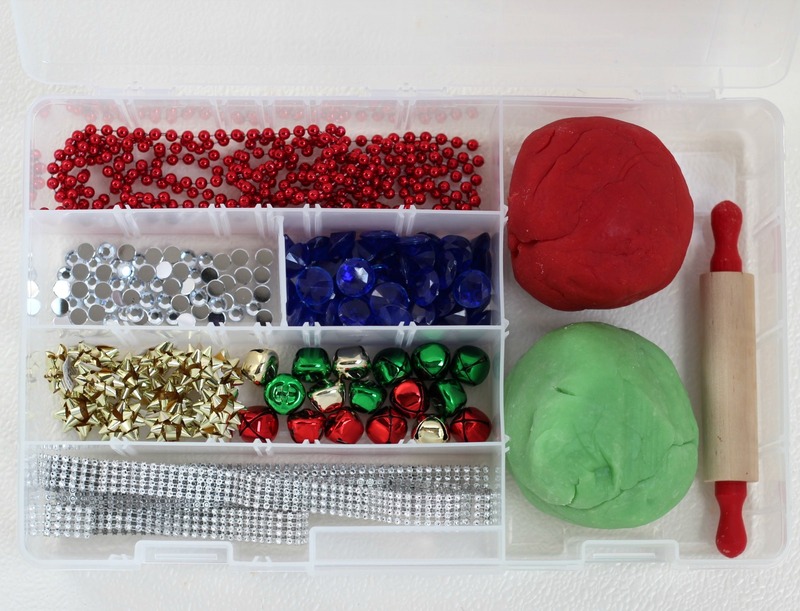 Along with the play dough, I placed a roller and items to play with: beaded necklace (cut into smaller pieces), gems, little bows, bells, and sequin strips. I also gave my little one a Styrofoam cone so he could create a Christmas tree! 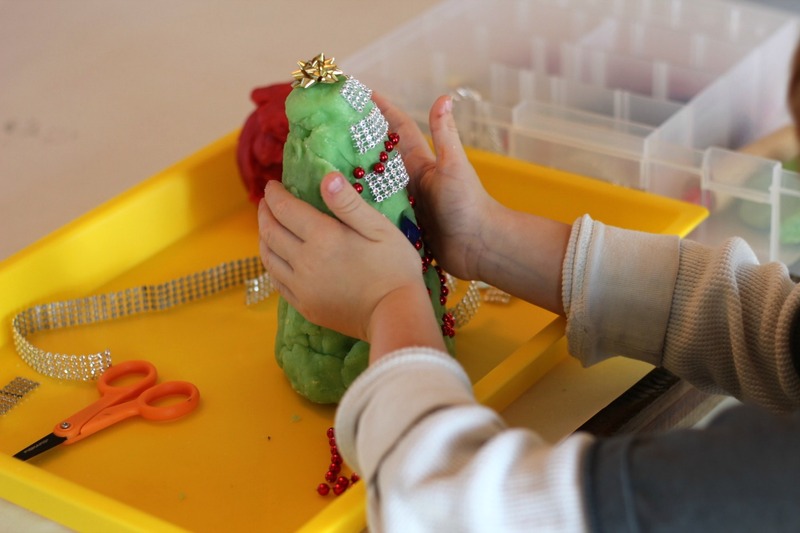 To make the tree, just place play dough around the Styrofoam and press together. You might need to help your child. After there’s enough dough, you can decorate the tree. It’s fun to see your little one’s creativity! After you’re done you can pack everything back into the box. Make sure to keep the play dough in an airtight container, such as a plastic sandwich bag. Have you ever made cloud dough before? It is the EASIEST activity and you only need a few ingredients to make it! I came up with a gingerbread version, which smells really good! Begin by mixing all the dry ingredients together with a spoon. Add in the oil and stir. After a minute of stirring, use your hands to knead the cloud dough together. It should be slightly crumbly, but able to press together to create a ball. 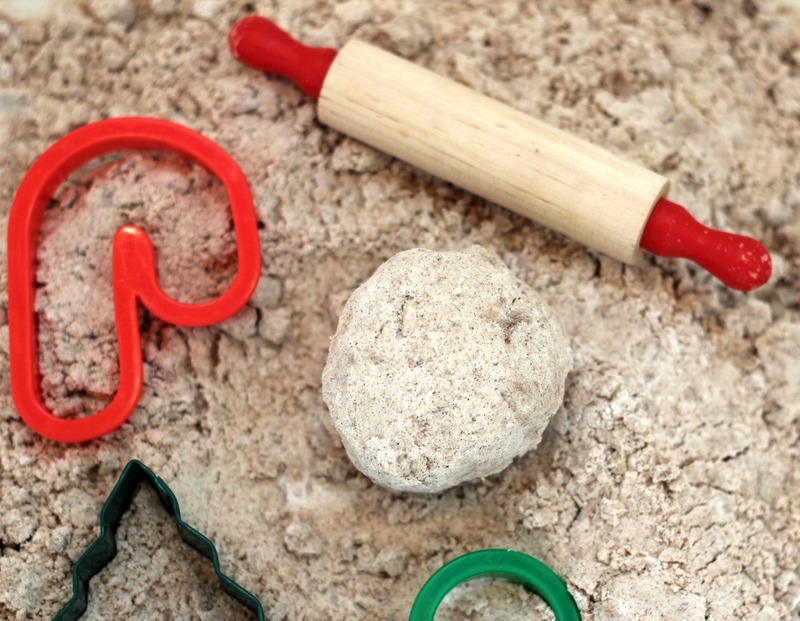 Add in some fun things to play with: rolling pin, cookie cutters, small vehicles, etc. 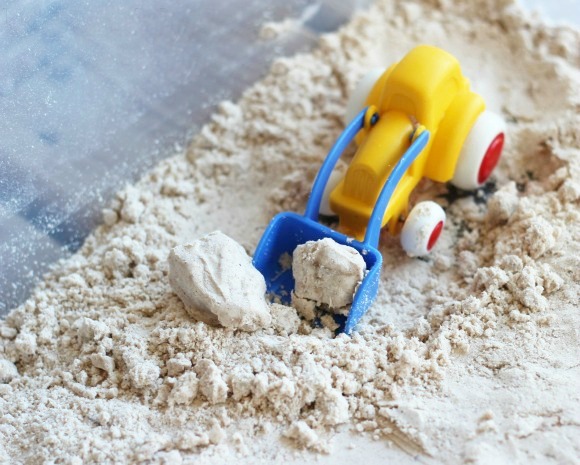 Invite your child to play with the dough! 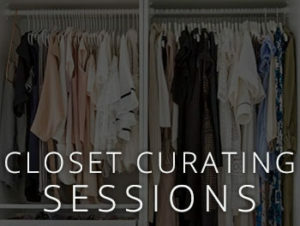 Since this one is slightly messy, I recommend doing this outside or placing a large towel or blanket underneath the bin. Anything that falls on the blanket can be poured into the container or thrown away. 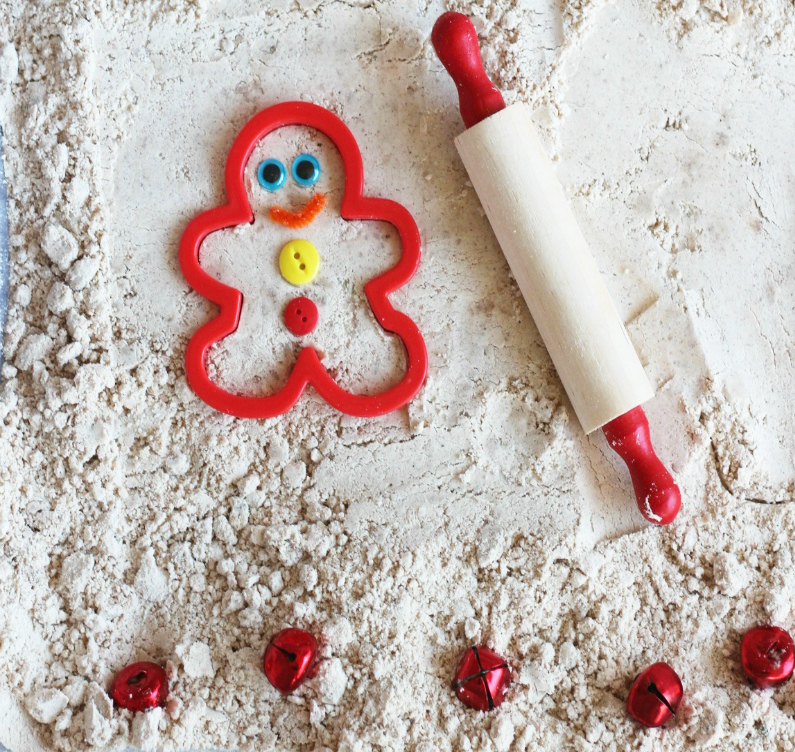 One fun thing you could do is to place a gingerbread cookie cutter in the dough and then decorate it to look like a gingerbread man! Add little googly eyes, buttons and a smile! This cloud dough stays good for a long time! You can add a lid to the bin or place the cloud dough in a Ziploc bag. A classic sensory play activity is playing with rice. I know it sounds a little crazy, but kids love playing with rice! I’ll teach you an easy way to color rice, but you can use this method to also color dry pasta. This recipe is colored and scented! Pour 1 lb of rice into a Gallon-sized Ziploc bag. Add 2 teaspoons of rubbing alcohol or vinegar, close the bag, and shake it up. Open the bag and add in a few drops of food coloring and a few drops of peppermint oil. Close the bag and shake. Line a tray with parchment paper. Pour the colored rice on the tray and spread it out using a spoon. Let it air dry for 1-2 hours. Repeat to make another color. After the rice is dry, pour it to a plastic bin and add in some things for your little one to play with. We like to add spoons, funnels, different size containers, measuring cups, and anything else you think your child would like! My kids like to scoop the rice in their hands or use a scooper and then fill a container with rice. This rice is peppermint-scented, so make sure your child doesn’t touch the rice and then rub their eyes! 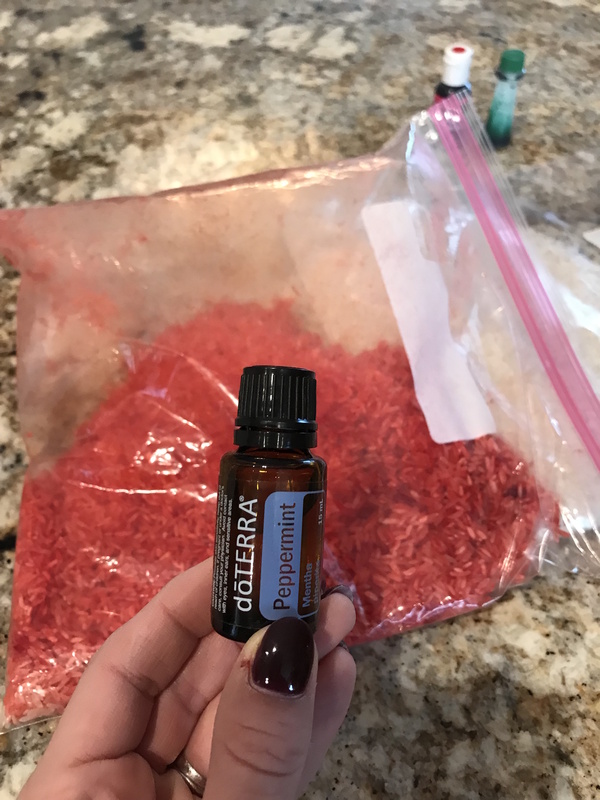 If you think your little one will rub their eyes, I would wait until they are older to try this out or do the recipe without the peppermint oil. The rice will stay good for years! Make sure to store in an airtight container. 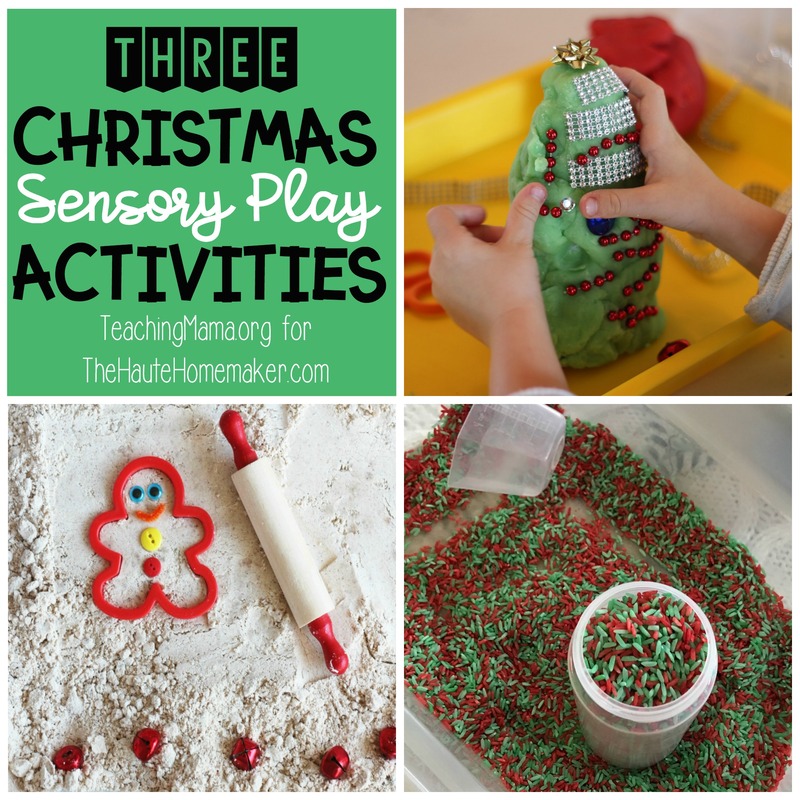 I hope these ideas give you somewhere to start with sensory play! Sensory play is very important and even just doing this every once in a while will be beneficial for your child! * Angela is the writer of Teaching Mama, where she shares hands-on learning activities for babies, toddlers, and preschoolers. She is a former teacher, turned stay-at-home-mom to 3 wonderful boys. 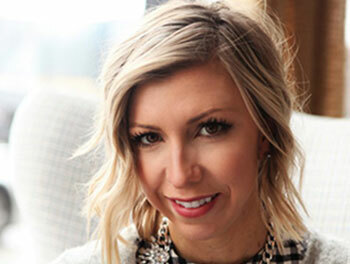 She is also the author of Play and Learn Toddler Activities Book, a book with over 200 ideas for keeping toddlers busy! 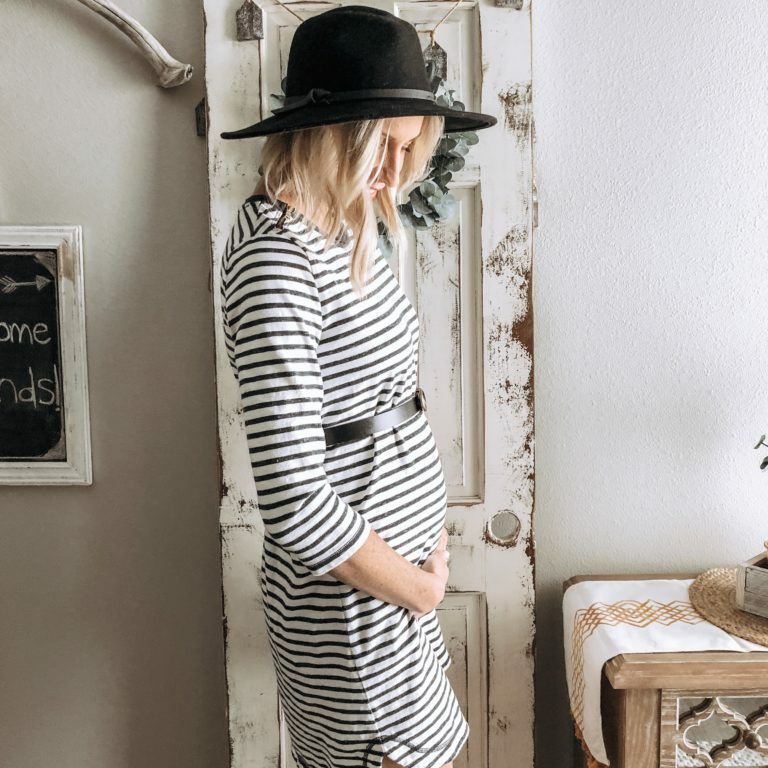 You can connect with her on Facebook, Pinterest, or Instagram. I hope this these fun ideas from Angela help you savor and slow down this holiday season, and enjoy some time with your littles!